If you own a small business, you know how important it is to keep your brick and mortar shop open and secure. Regardless of the type of business that you own, making sure that your inventory, computer systems, and even your employees stay safe at your business. There is no one security solution for every business as every business has a different set of needs and a different need for security. There are always technological security threats that you have to worry about like computer viruses and potential hackers, but the physical threats to your business are just as dangerous. From potential robberies to disgruntled ex-employees, your small business has a number of threats to worry about. The best way to keep your small business safe is by providing adequate security with smart locks and security camera systems. If you are looking for the perfect security system for your small business, talk to one of our expert salespeople here at GoKeyless. Trilogy has become one of the biggest names in the smart lock industry, with a wide variety of solutions that are perfect for businesses both big and small. The Trilogy T2 DL2700 Digital Commercial Keypad Lock is the perfect solution for businesses with wooden or metal doors. 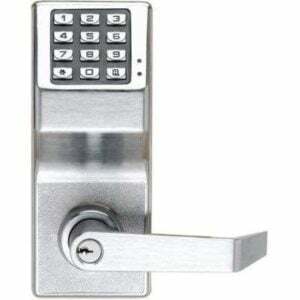 If your small business has sensitive data to protect or has important files, this lock works just as well on internal locks as it does on initial entry points. This lock can have up to 100 different codes and fits on most traditional lock and key style doors. If you are more old-school and prefer to use traditional keys, this lock comes equipped with a traditional locking system. No matter your security needs, this versatile locking system is a great place to start your smart small business security plan. The Trilogy Networx PDL1300NW Narrow Stile Digital Lock is a perfect solution for classic glass storefronts and narrow doors. With 2,000 programmable codes including different rankings like manager, supervisor, and basic employee, this lock is extremely versatile. You can also set up tracking software that will track up to 40,000 events including individual employee’s entry and exit times. If you prefer traditional lock and key systems but want the additional security that comes with smart locks, this lock is the perfect combination of both. The Yale Nextouch Sectional Mortise Touchscreen Keypad Lock is a great lock for small businesses. With a backlit touchscreen system that can easily handle up to 500 individual users, this system can grow seamlessly with your company. Yale locks have become some of the most trustworthy in the industry and are as easy to install as they are to use. This lock is a beautiful and stylish option for any business looking to upgrade their security. No matter how big your business may be, a smart lock and keyless security system is the best way to keep your business and inventory safe and secure. If you want to learn more about the systems that would work best for your business contact the experts at GoKeyless today!